Many of my clients have special requests… a special view, a portrait, custom furniture, a pool house, the tile on the bottom of the pool. These are several of the projects completed in the last couple of years. 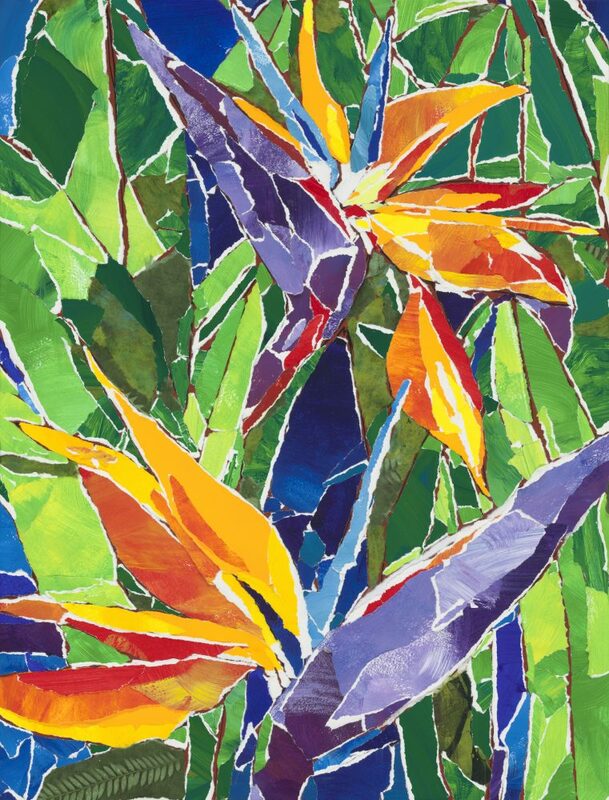 One of my larger collages was of birds of paradise. Lots of color and excitement but bigger…48” x 66”. Brooke wanted those birds but in a smaller format. 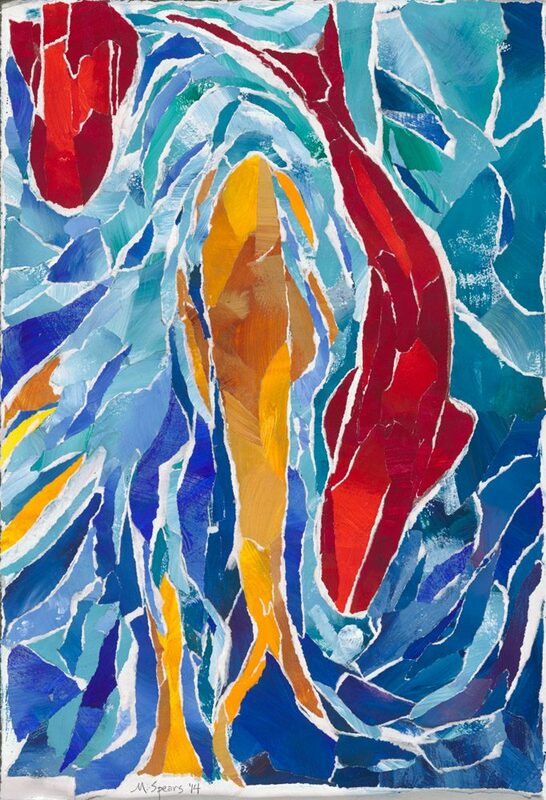 Hedy saw the koi collages and loved the stained glass feeling of the work. She wanted something smaller and a different size ratio. Hedy’s Koi was the result. Over the years of visiting the Island of Hawaii, the one place that captured the years of snorkeling and diving and playing in the ocean for my clients, is Maka’iwa Bay. They wanted the Winona moored in the bay to be the centerpiece of the living room in their new home at the resort. 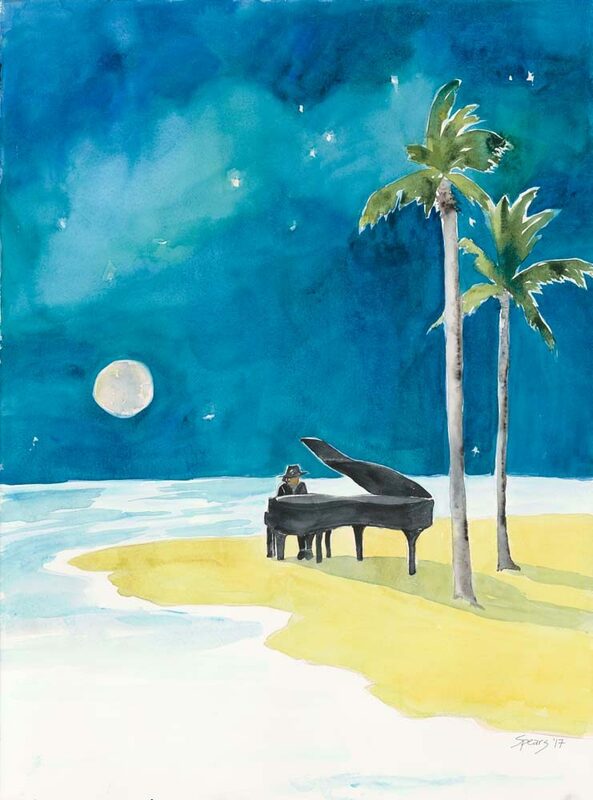 Piano on the Beach - Watercolor - 22” x 30"
The Hawaii Performing Arts Festival (HPAF) is one of the most exciting events we have annually. It features artists from around the globe. 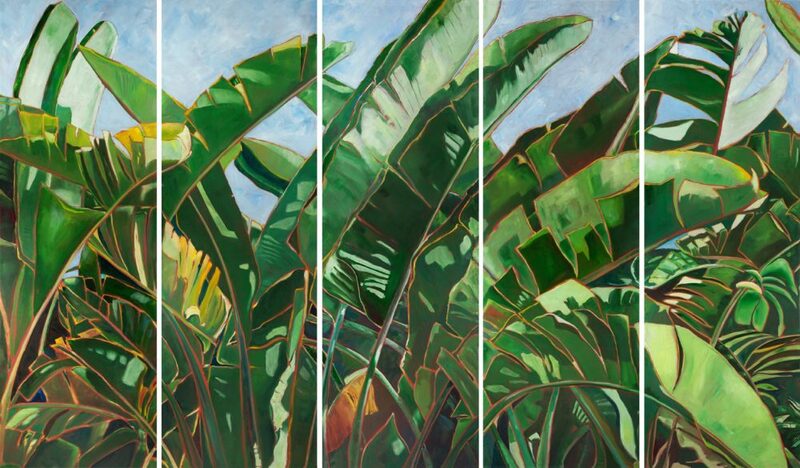 This year, they commissioned a painting that evoked the islands and the magic of the music. The piano player might resemble Val Underwood at the keyboard with his signature hat. 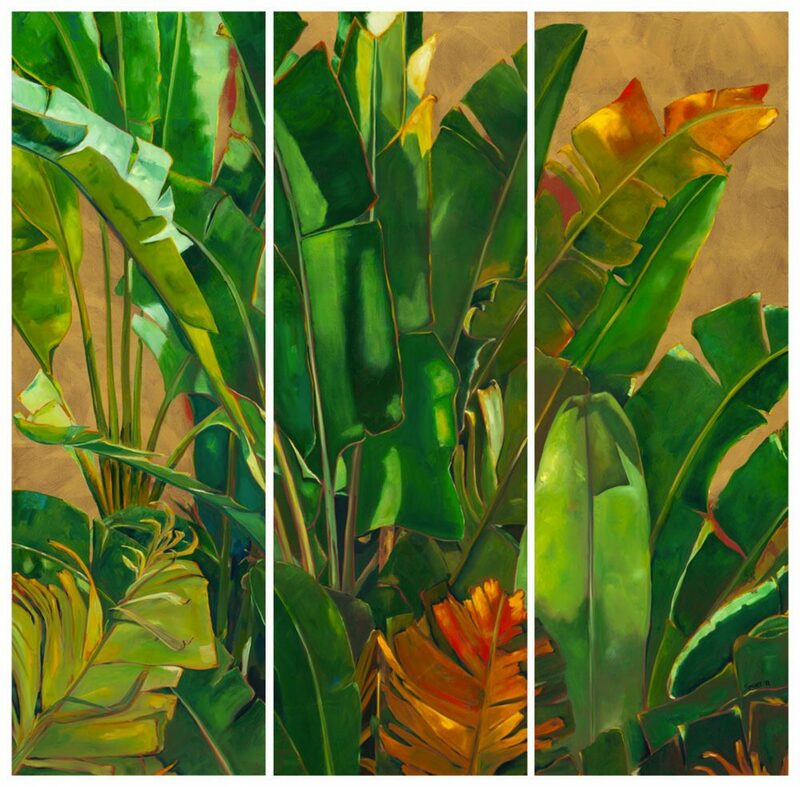 For a beautiful new home at Hokulia, I was asked to create a wall of leaves for a door panel system. The panels were delivered to my studio and over the next four months, I worked on the painting. Was incredible to see it in the open space of their great room after months of having it fill my studio. The founder of Jupiter Research Foundation, an organization that launches whale-o-phones every year off of Puako to listen and broadcast humpback whales songs over the internet among many other innovative scientific projects, asked me to decorate one of his ukuleles. 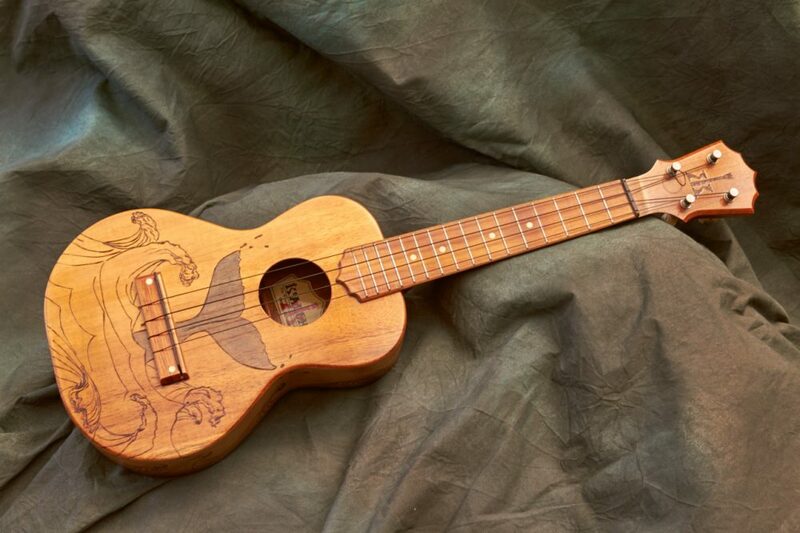 The decorations on the ukulele were inspired by humpbacks and their songs. I imagined the sound waves of the humpback songs emanating through the ocean. The sides were roiling waves and the top of the ukulele featured the whale tail that symbolizes what most of us see when we look out across the ocean in the winter months. 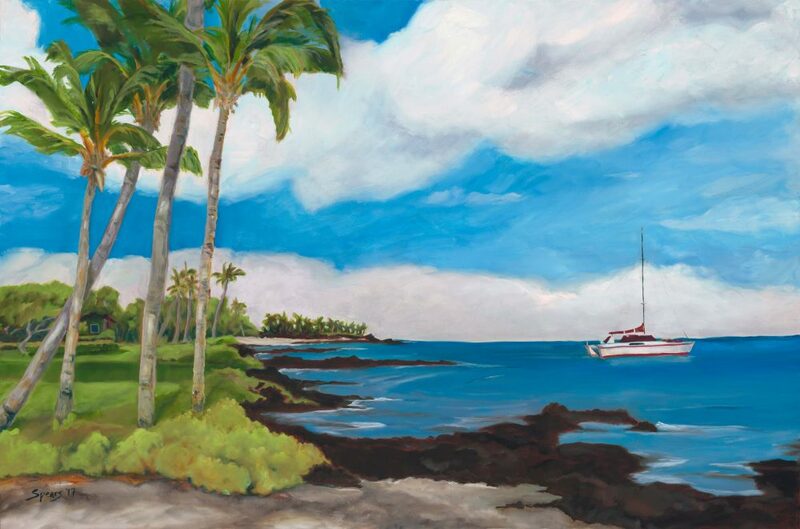 Where's Bob - Gallery Wrapped Oil on Canvas - 16” x 20"
One of my favorite people ever, wanted a reminder of the winter home he enjoyed in Kohala. 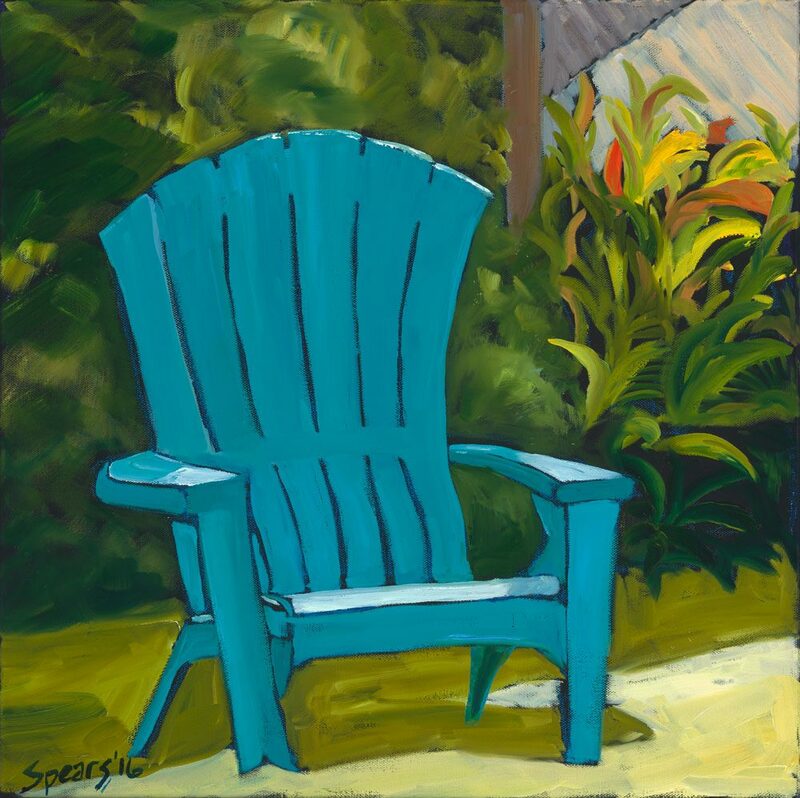 His regular spot was to sit in the Adirondack chair in the lush front yard and watch the world go by. One of the most spectacular experiences in Hawaii is surfing and looking up at Mauna Kea with snow on the summit. A client asked me to create a painting that would remind them of their experience like that at Makaiwa Bay. 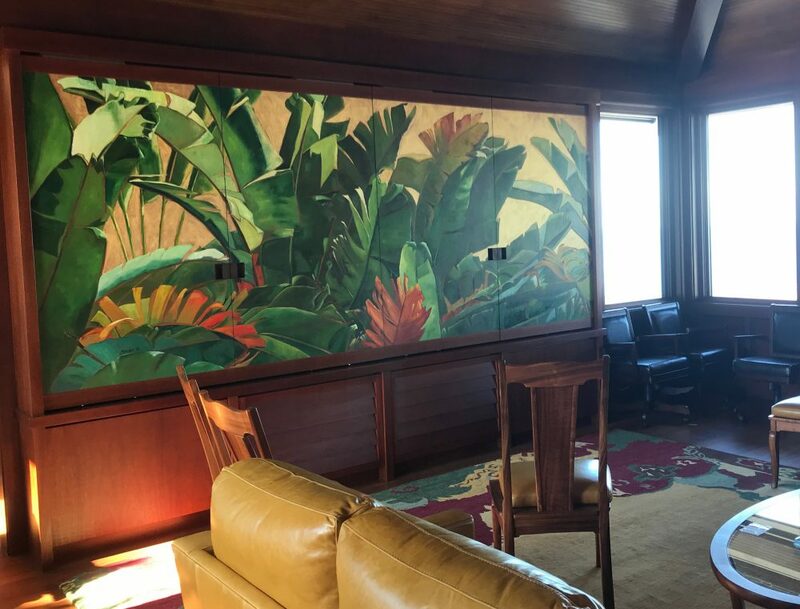 After visiting the botanical gardens near Hilo, my clients wanted some of the lush, tropical flora for their home in the desert. Brandie and her husband ate dinner at Merriman’s one night a decade earlier when they were just married and just finished their university educations. 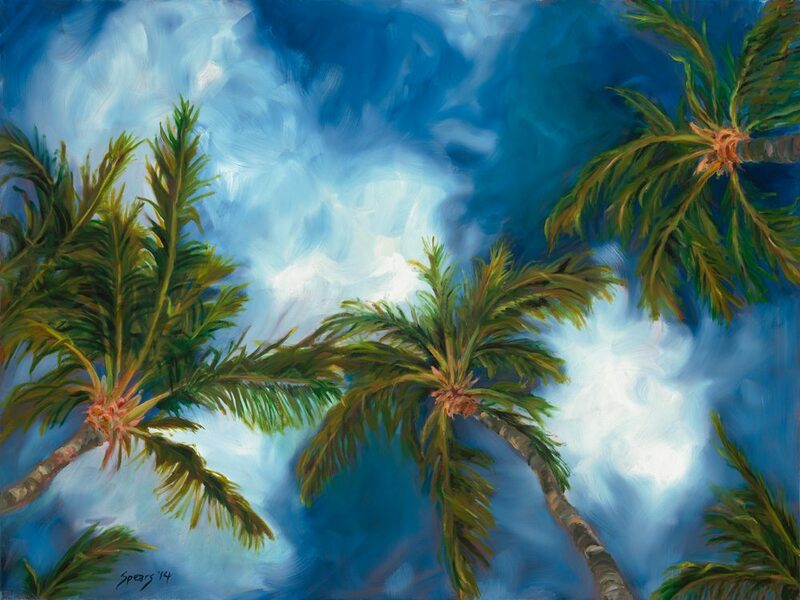 Brandie fell in love with one of my paintings looking up into the palms from the vantage point of lying on my beach towel. They didn’t have the money then. She came looking for me and asked if I would paint her one from her favorite beach. Clients wanted to celebrate their experience of Hawaii and a big part of their experience is swimming and paddling to and from Kua Bay. Their son took a photo of Kua during a helicopter flight, and that formed the basis for the collage. 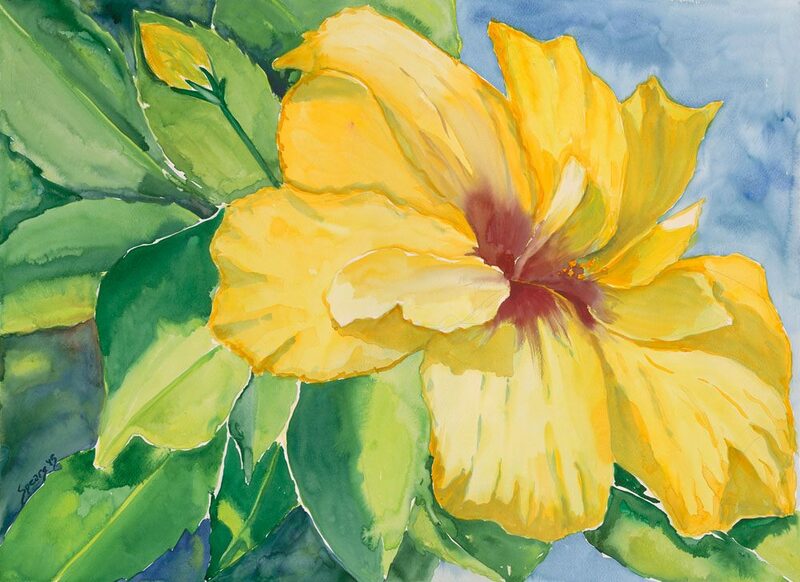 This was one of two watercolors created for a home in Southern California. My client wanted hibiscus and had never been successful at growing them their so he brought them home from Hawaii. One of my favorite designers called and wanted a piece for a dining room at a home he was working on in Maui. The piece was destined for an inset area behind the dining room table opposite a window wall with a view towards the ocean. The golden background reflects the evening light as the sun comes in the window in the late afternoon. 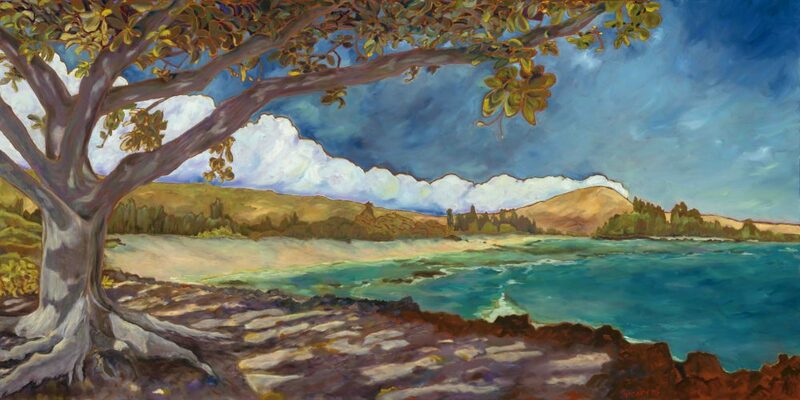 Created for home at the Mauna Kea Bluffs. At the top of the entry stairs across from the elevator is a long hall. My clients wanted something to lighten up the area and make it feel like when the elevator doors opened, you were looking into the garden. Kauna’oa Bay at Mauna Kea Beach Hotel is a favorite spot for many of us. 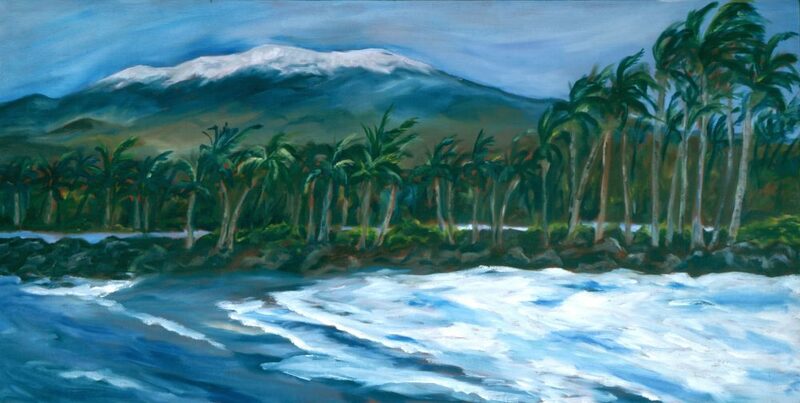 Jody wanted to capture the feeling on the waves on the beach in front of the hotel for her home in California. The assignment was to replicate the type of ocean that either makes you seasick or rocks you to sleep (depending on your predilection) for a bedroom. 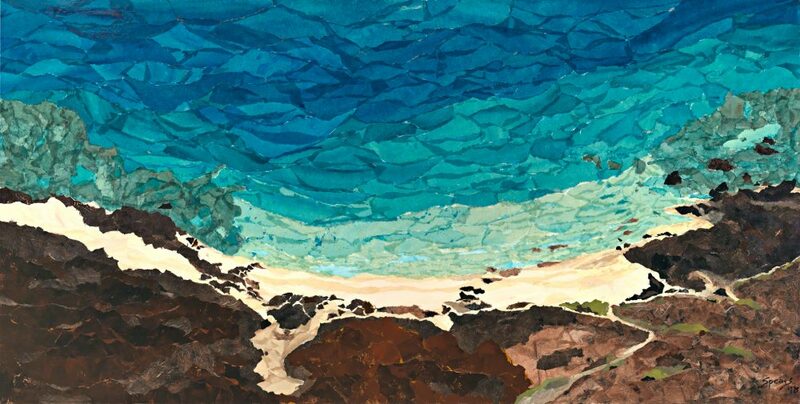 Inspired by the approach that Konen and Hiroshige took to represent the ocean, I created a series of painted papers that would be my pallet both for color and textural purposes and started creating that rocking motion you see in wild stormy seas. 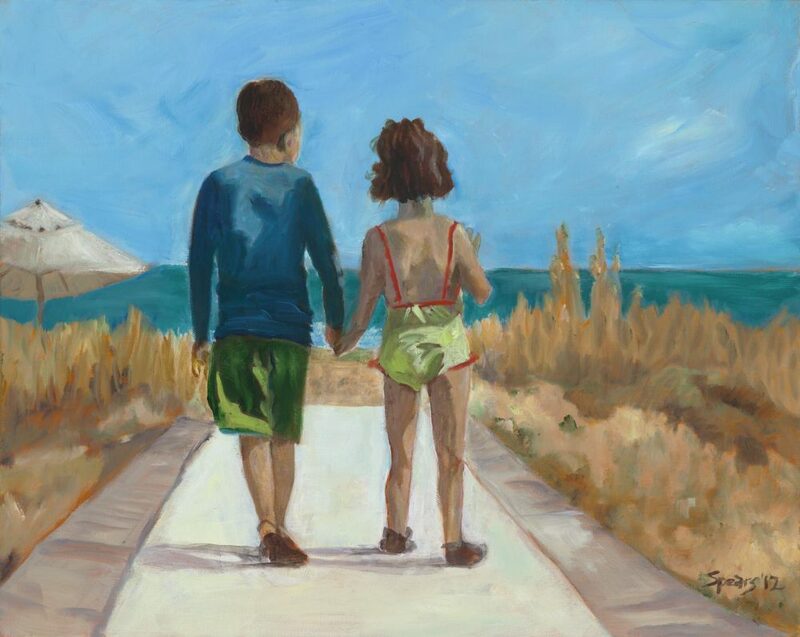 A painting of my friends children as they walked to the beach near their home in South Carolina. Before the Four Seasons resort was built, I used to hike the coast between Kona Village Resort and Kua Bay. Clients asked if I would create a painting for their home at the Four Seasons showing what the shore used to be like. 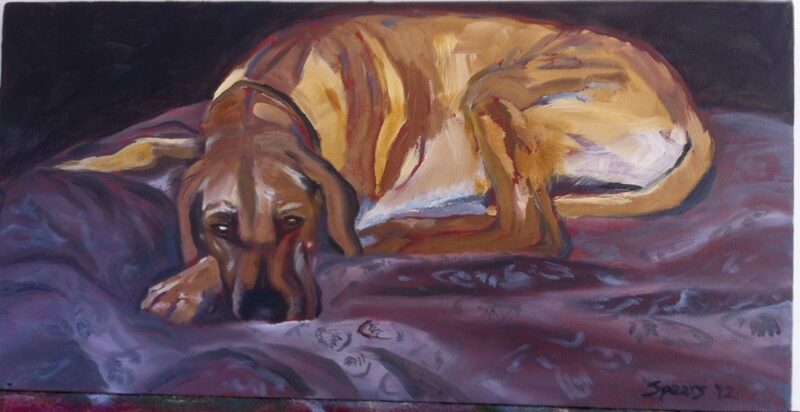 My dear friend Deb wanted to surprise her husband with a painting of his Rhodesian ridgeback, Joe. Joe and I spent an afternoon together and this seemed pose seemed to capture one of his normal ways to spend the day, keeping an eye on things from his special bed.